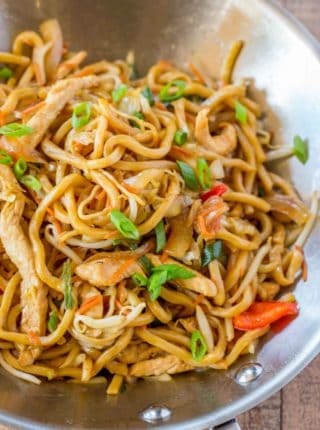 Homemade versions of our favorite takeout dishes are some of our favorite weeknight dinners, like Chicken Lo Mein, Easy Mongolian Beef, and Panda Express Orange Chicken (Copycat)! 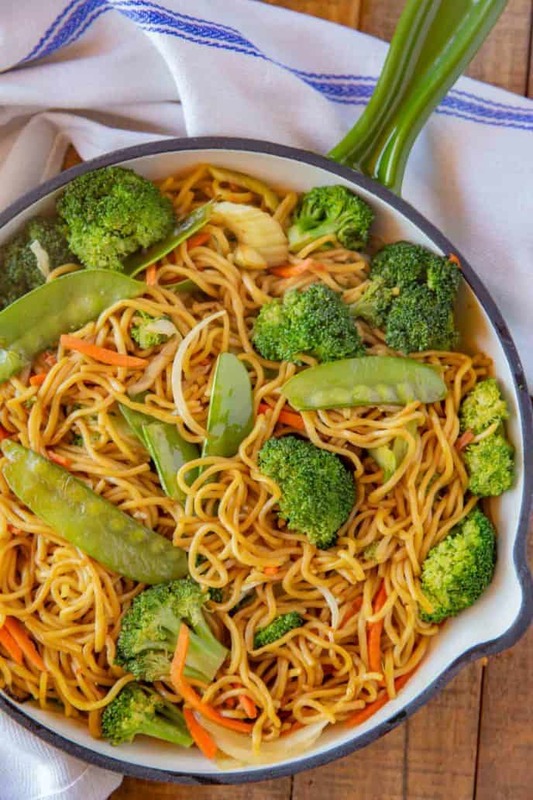 Vegetable Chow Mein is an EASY one pot dinner, loaded with veggies and tossed with chow mein noodles in a savory sauce. This recipe is a meatless take on my Classic Chinese Chow Mein, and is my go-to on weeknights because it takes a total time of 30 minutes to make. 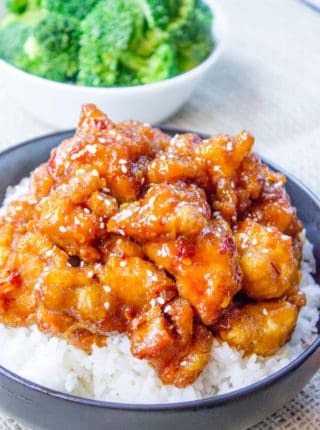 If you’re looking for more homemade takeout dishes to complete your dinner table, check out my General Tso’s Chicken, Easy Sesame Chicken, Pad See Ew, and Egg Foo Young! CAN YOU FREEZE VEGETABLE CHOW MEIN NOODLES? Chow mein is a great recipe for making ahead and freezing for up to several months. Defrost the chow mein in the refrigerator, then reheat in a wok or skillet, adding extra sauce as needed if your chow mein noodles dried out at all. 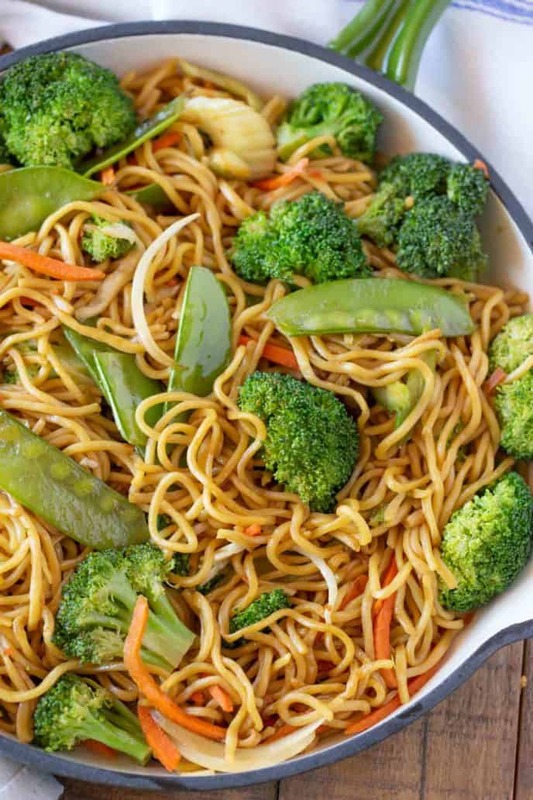 WHAT IS THE DIFFERENT BETWEEN VEGETABLE CHOW MEIN AND VEGETABLE LO MEIN? 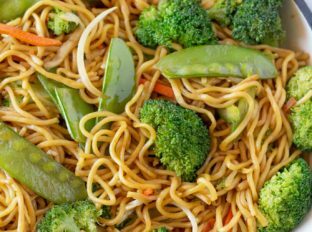 Chow mein and lo mein are both made with egg noodles, but the main difference between the two dishes is the way the egg noodles are prepared. Chow mein noodles are thinner and fried, giving them a crispy texture, while lo mein noodles are are boiled, making them softer. 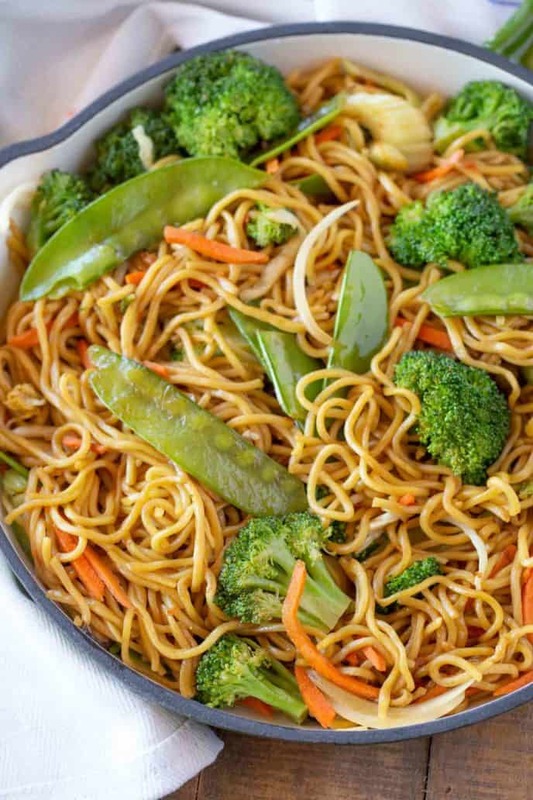 Lo mein is also usually stir fried with the vegetables, while chow mein is tossed with them towards the end. In a pinch, you can substitute lo mein noodles with spaghetti noodles. Lo mein noodles are usually a little bit thicker than the noodles used for chow mein. Chow mein also uses less sauce, while lo mein is stir fried in sauce until the noodles are totally coated. You can buy noodles that are specifically labeled for chow mein in the grocery store. 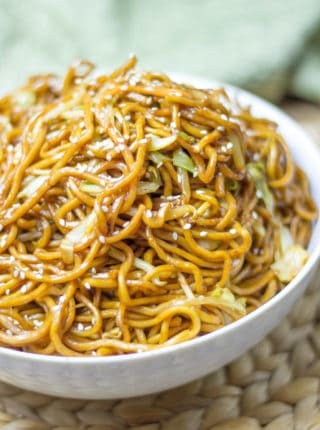 If you can’t find them, you can substitute yakisoba noodles (minus the rest of the packet) in place of chow mein noodles, but I wouldn’t use these for lo mein. WHAT OTHER VEGGIES CAN I ADD TO VEGETABLE CHOW MEIN? CAN YOU MAKE CHOW MEIN AHEAD? You can prep this chow mein ahead of time by cooking the dish as usual, then letting it cool completely and storing in an airtight container for 3-4 days. If you are going to store this, I would also store extra sauce, because the noodles may dry out when reheated. 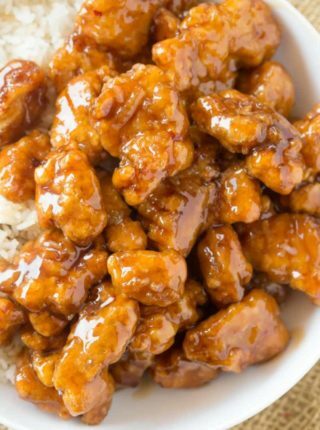 You can swap the vegetable oil with sesame oil for a deeper savory flavor in the dish. Sesame oil has a very distinct flavor, so make sure you like it before adding it to the wok. You can also mix a dash of sesame oil with the vegetable oil to add a small amount of sesame oil flavor. You can make this recipe in a large skillet or a wok, depending on your cooking preference. Traditionally, this chow mein is made in a wok over high heat. The high heat of the wok makes a big difference in the flavor of the dish! If you decide to make your chow mein in a wok, be ready to stir the food constantly so it doesn’t burn or overcook. You can find woks in plain or electric varieties. Make this chow mein low carb by using tofu noodles. I recommend soaking the tofu noodles in water for 10-15 minutes first, to freshen them. You can use low sodium soy sauce to make a reduced sodium chow mein. Add minced fresh ginger or a dash of ginger powder for extra flavor. This is a vegetarian chow mein if you use the vegetarian-friendly version of oyster sauce. Prep the ingredients early, including cutting up all of the vegetables, because they will cook quickly once in the skillet and you don’t want anything to overcook while you’re chopping the next ingredient. When prepping this ahead, you can whisk all of your sauce ingredients together in a small bowl, so you just have to pour it in. Use some cayenne pepper to add heat. You can add boneless skinless chicken for chicken chow mein, or shrimp, beef, or tofu to add more protein to this recipe. Stay away from dark soy sauce for chow mein. I like to use light or regular soy sauce because it has a better flavor with the noodles. This is one of our favorite go-to meals. Turns out perfect every time. So good, thank you. This is a great way to bring Chinese takeout into a boring weeknight meal routine. Thanks for a great recipe! This looks so good! Always love your recipes! This is so much better than takeout! So glad you enjoyed it, Sommer! I love this for a delicious weeknight meal! So good! I plan to substitute the homemade Kecap Manis as I don’t have any available. Is the substitution as written (reduce from 2T kecap manis to 1T homemade or should I double the homemade kecap manis formula to end up with 2T to use? Sorry for the confusion. Just double the homemade recipe and that’ll work perfectly.